Having seen the odd review or two of grey fountain pen inks, I had never considered grey to be one I would buy for everyday use. Blacks, blues and blue-blacks yes, however grey? Probably not for me. 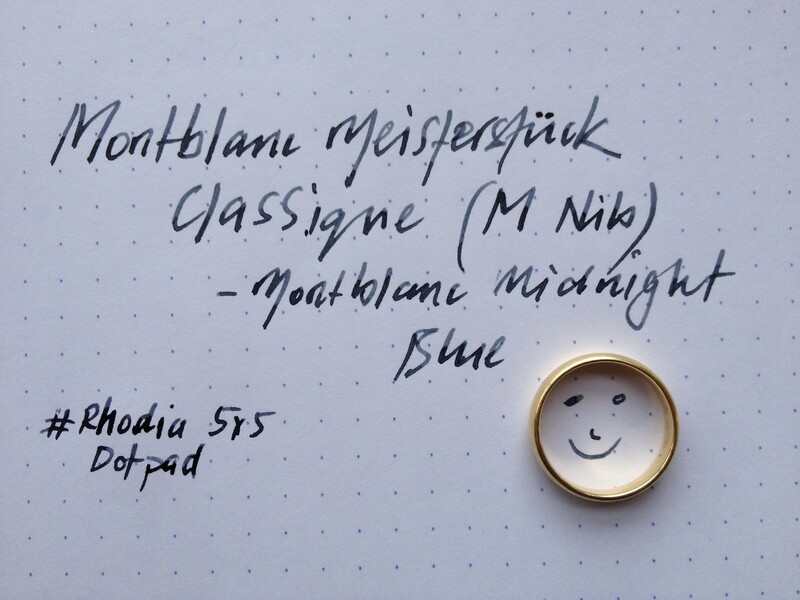 When the Montblanc Meisterstück 90th anniversary year got into full swing there were some great looking products circling the internet (all above my budget). 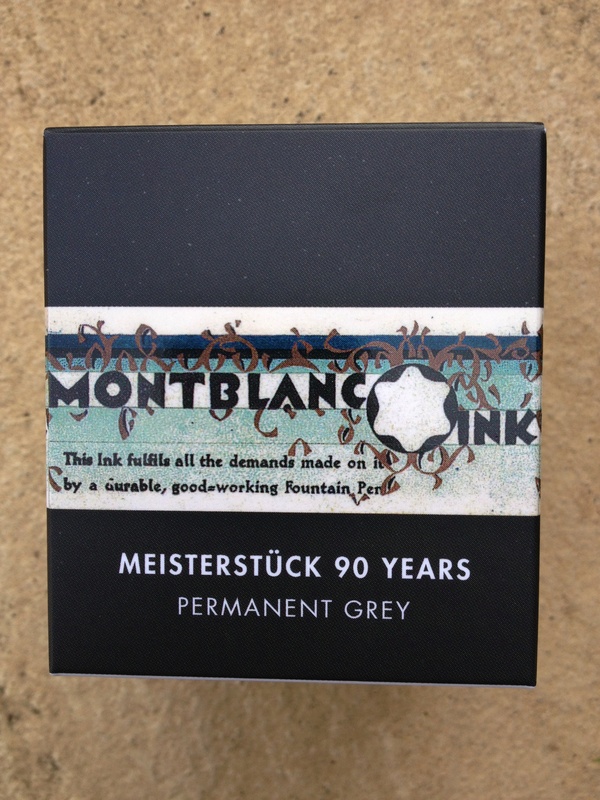 Thankfully, amongst them, the Meisterstück 90 Years Permanent Grey ink. There was never any question I would buy the ink given the special edition, and the beautiful bottle sealed the deal. The opportunity to try some grey ink was also quite a draw. 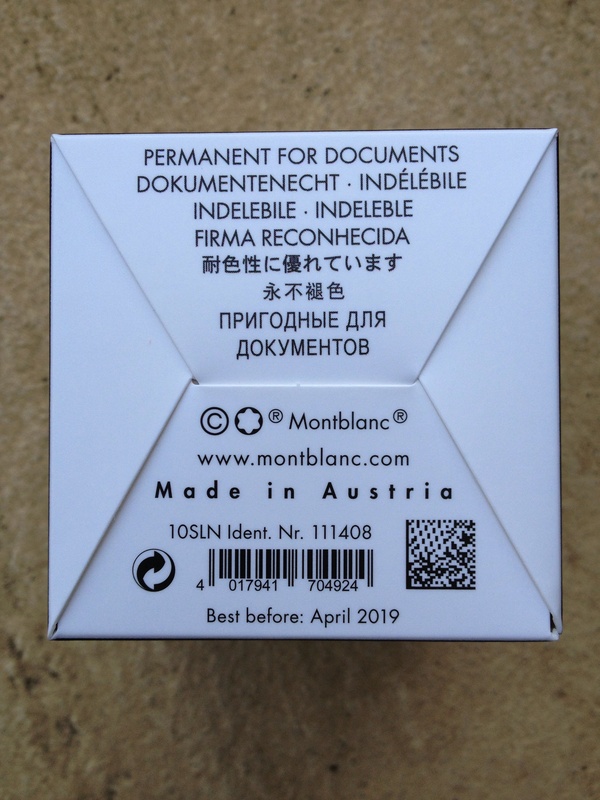 At AUD$30.00, it also provided a way to leave the Montblanc store with an actual purchase rather than merely having drooled over much of what was inside, only to be thwarted by price tags. To the lovely sales lady (whom probably is titled a Pen or Luxury Goods Consultant – meaning absolutely no disrespect) who suggested I also buy a matching 90 Year Meisterstück pen with rose gold accents – thank you, but at AUD$700, not today. Similar to being asked, would you like a Bentley to go with your can of metallic spray paint sir? The 90th Anniversary celebrates the creation of the Meisterstück fountain pen in 1924, which at the time was thought of as having quite an innovative ink feed system, along with a hand engraved gold, iridium tipped nib. This ink would be a perfect companion to my own Meisterstück Classique fountain pen, which is now in it’s seventeenth year of use. Upon opening the elegant 35ml bottle, the ink looks decidedly black to the naked eye. A gentle dip of my finger and smear across a piece of paper confirmed the “greyness” until I had a chance to ink up a pen a couple of days later. 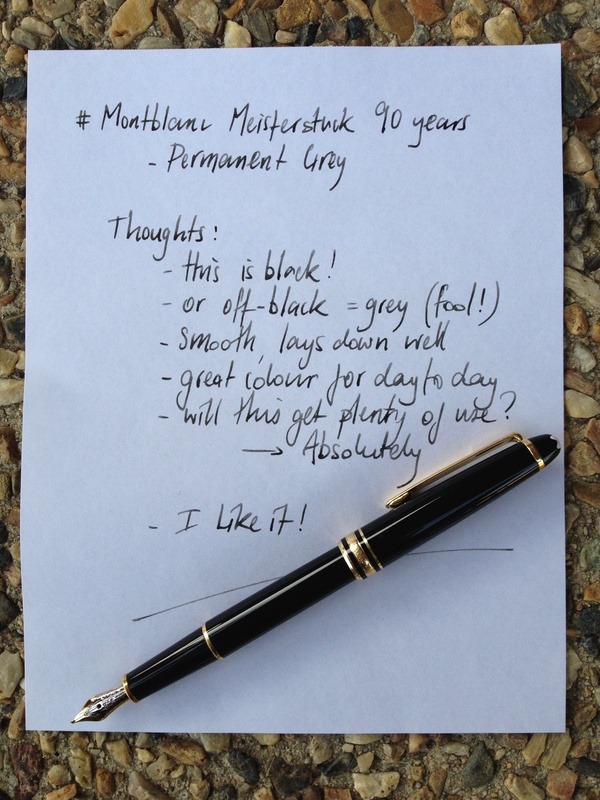 Once in my pen (the Meisterstück Classique of course) to test, it was time to see how ink fared with the written word. My initial thoughts, unsurprisingly were again “this looks black”. Perhaps due to the combination of my lack of experience with other grey inks and the tendency of the ink to dry a little lighter over time. 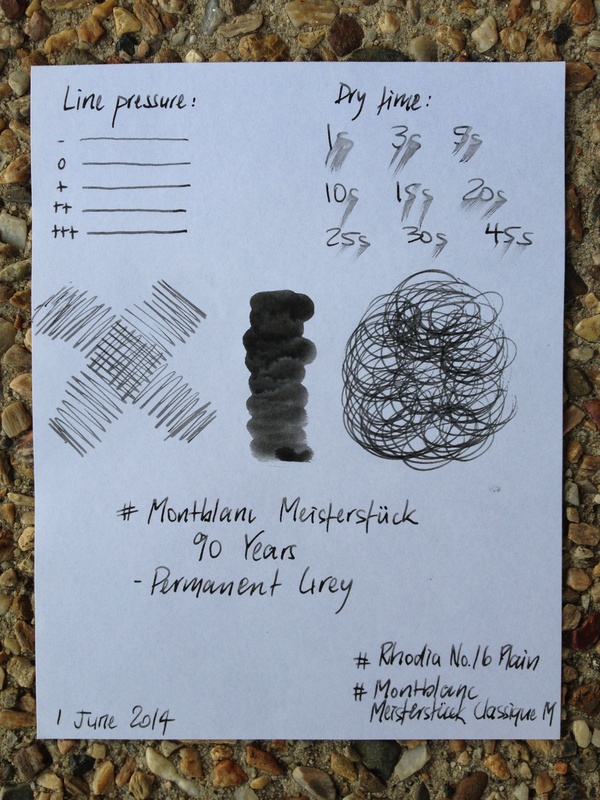 I would imagine the correct name for an ink that looks “off-black”, would be grey, and that same ink needs to be dark enough to be called Permanent Grey, as is the case here. The written sample was undertaken on a plain Rhodia No. 16 pad, and the ink performed very well. There was some nice shading many of the letters, with pen speed largely dictating the depth of the grey in each pen stroke. My hand written words darker overall, due to the slower speed used to ensure the words were at least semi-legible. As the speed of the pen increased with what I technically call the “squiggle samples”, the ink became far lighter and was probably closer to what I expected out of the bottle. I probably prefer the fact that words written are darker, as the ink will be more suited to many everyday work applications. It might be interesting for those with a dab hand at sketching (sadly not I), given the different shades achievable. For writing, an F or EF nib perhaps may produce a consistently lighter shade of line. The more I look at this ink on the page, the more I think there may be a perception it is a lower quality black rather than a grey, if the ink type is unknown to the viewer. The ink flowed well, and although a spectrum of shading was evident, no hints of skipping or too-dry a line were apparent. The line was crisp and sharp at the edges, with no feathering or bleed. Dry time was in line with many inks, at around 20–30 seconds, though at times longer depending on the particular line thickness. A smoother, more consistent hand than mine would no doubt achieve a more defined dry time. 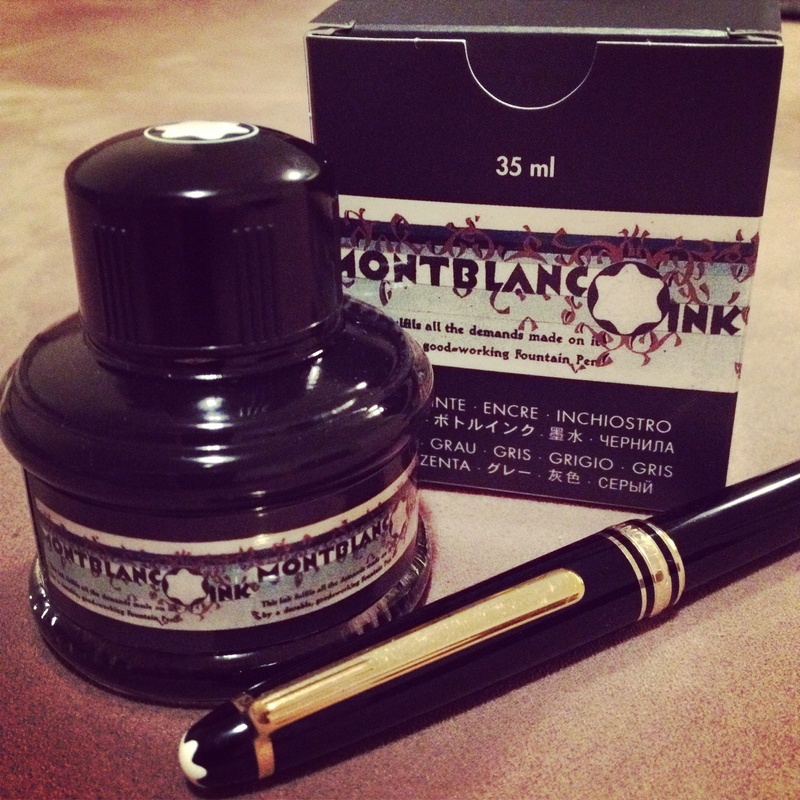 Overall, I think Montblanc have a winner here, with the combination of a great ink and very attractive presentation in a bottle worthy of the Meisterstück 90 Year Anniversary occasion. My first impressions lead me to think this ink will see plenty of use, which is great, as although a special edition is nice to own and display, I would be disappointed to look longingly at the bottle knowing I disliked the ink. For me, an ink is there to be used, and a Special Edition even more so, although a suitable rationing system will no doubt be put in place! 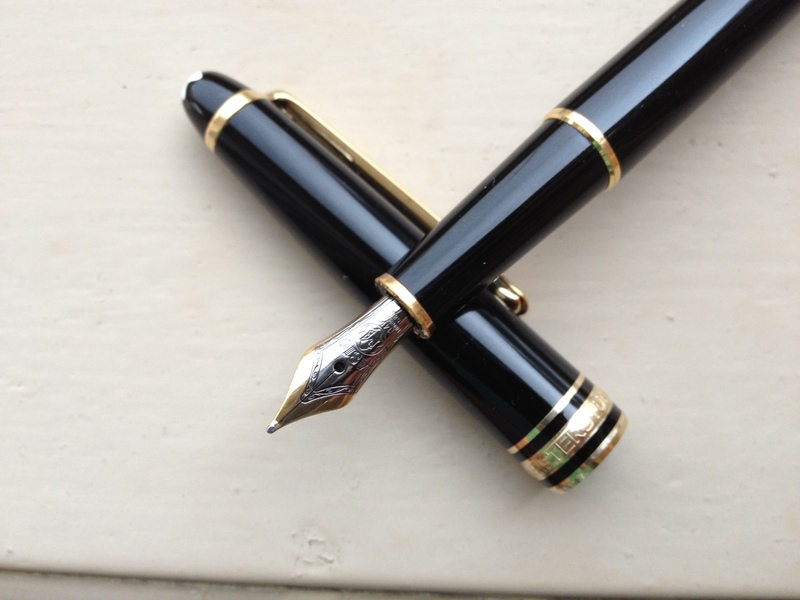 This Friday, November 1 is the second annual Fountain Pen Day. My original “fountain pen day”? That was sixteen years ago, the 20th day of September 1997, when I received the gift of a pen from my beautiful wife. The very same pen is with me every day, and is a constant joy and delight to use. Over the past sixteen years, I have used a limited range of inks, never venturing beyond the Montblanc variety, usually black or blue-black. Currently it is inked with Montblanc Midnight Blue. The nib is medium, and although a little broad for everyday work use, this is how I like it – something I use for enjoyment, not utility. It is the slight imperfections in our endeavours that define us all and make us unique. The cup that just misses or the tail on the q being a little too short. The journey from line to line will take you towards it. Where? To somewhere you can only go in that moment of angle, pressure, ink flow and concentration. When to reposition your hand, whether the pen is rotated to the nib sweet spot, if I’m going to hit that fleck in the paper that may throw off my rhythm. The perfect piece of written prose in perfect cursive? Never. This pen as the perfect companion for a lifelong writing journey? Yes indeed. Another perfect companion for a life journey on that same “fountain pen day”? Absolutely. That day sixteen years ago was my wedding day.